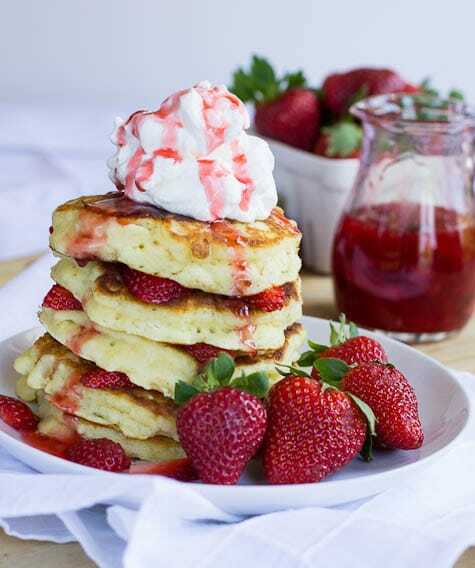 Fluffy and tender buttermilk pancakes drizzled with fresh strawberry syrup and topped with whipped cream. 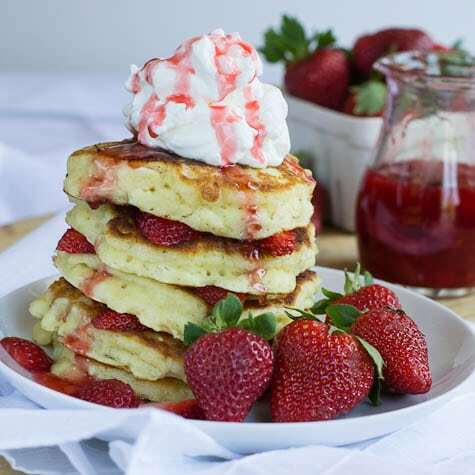 These Strawberry Shortcake Pancakes are the perfect way to celebrate the arrival of spring. I used my favorite buttermilk pancake batter which is hands down the best there is. It produces thick, but fluffy pancakes that are super buttery. It’s a recipe that I’ve made for years that was originally published in My Mother’s Southern Kitchen: Recipes and Reminiscences . The batter will be thick and in order to cook it all the way through you will need to cook them on lower heat than you usually would cook pancakes or else the outsides will burn before the inside cooks. And be patient. Resist the urge to press down on the tops with a spatula. But trust me when I say these are the best pancakes you will ever eat. Cooking with Gifs did a pancake recipe test and this one won against two others. My super talented friend Consuelo made them for her blog Honey and Figs and took some gorgeous photos. If you want to go full force with the strawberries you could chop some strawberries or thinly slice a few and add them to the batter. 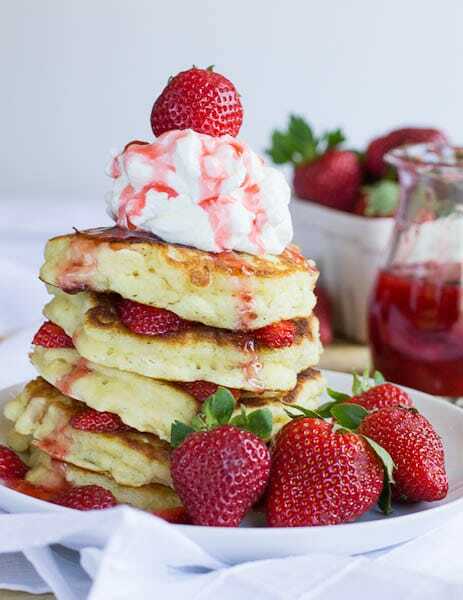 Instead I just layered a few sliced strawberries between the cooked pancakes when I stacked them. 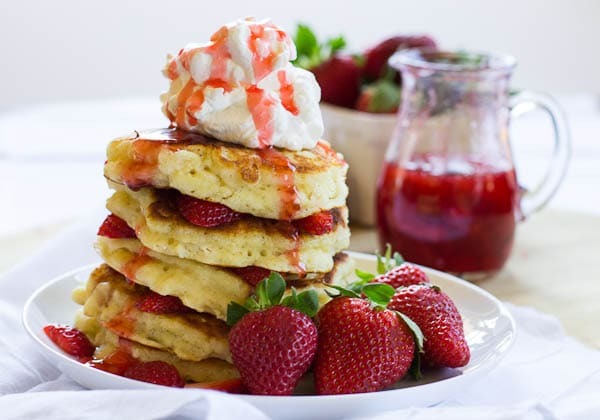 The breakfast version of strawberry shortcake! 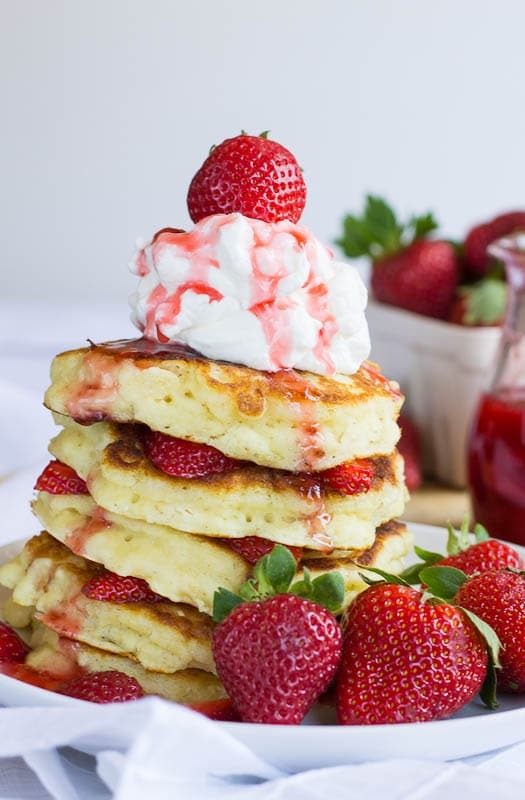 Fluffy buttermilk pancakes drizzled with strawberry syrup and topped with whipped cream. Make Strawberry syrup first. Combine strawberries, 1 cup water, and 1 cup sugar in a medium saucepan. Bring to a boil. Boil 10 minutes. Reduce heat to medium-low and simmer 10 more minutes. In a small bowl, whisk together cornstarch with 1 tablespoon water. Pour into syrup and whisk well. Boil for 1 minutes and remove from heat. Make pancakes. Mix dry ingredients in large bowl. Combine egg, butter, and buttermilk in medium bowl and whisk to combine well. Add buttermilk mixture to dry ingredients and stir until combined, but not more than necessary. Batter should be thick, but you can add a little more buttermilk if desired. Heat large nonstick griddle pan or large skillet over medium heat. Place about ½ teaspoon of oil on pan for each pancake and using a measuring cup scoop batter and pour on top of oil using about ¼ to ⅓ cup batter for each pancake. Flip when bubbles start to rise to top and continue to cook until batter cooks all the way through. These are hearty pancakes and the batter will still be gooey in the middle if not cooked long enough. Be sure to keep heat low enough so that pancakes do not burn. 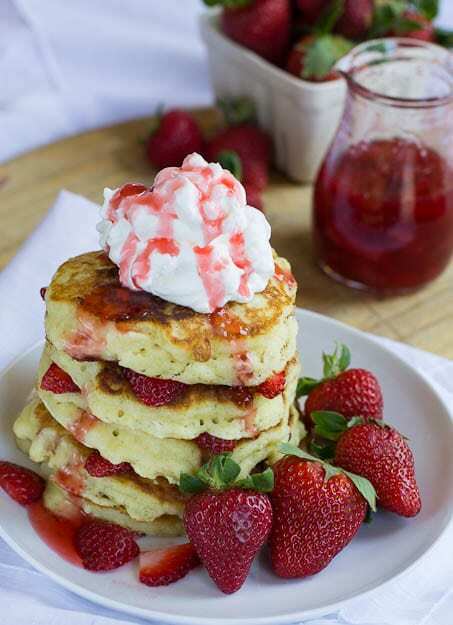 To serve place sliced strawberries between pancakes as you stack them. Top with whipped cream and strawberry syrup. Why Not Have Dessert Pancakes For Breakfast Every Weekend? 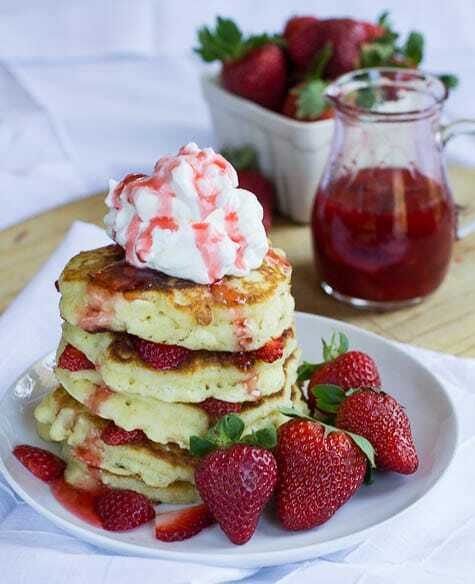 This entry was posted in Breakfast and tagged buttermilk, pancakes, strawberries. Bookmark the permalink. Ohhhhh wooooow, these pancakes would make a killer breakfast! What a wonderful stack! These look crazy good! I love strawberry shortcake, but if I can eat it for breakfast, that’s even better! Yes, please! I would like these pancakes for my breakfast more than anything! Mmmm! Those fluffy pancakes look amazing! I love this! The weekend is upon us and I’ve got pancakes on the brain. Seeing this, I need to up my game! They look very impressive…I need to get my hands on some good strawberries!! What a wonderful way to start the day. I’ll be happy when beautiful ripe strawberries arrive in our market. The ones now are pale and have no sweet smell to them. This is kinda genius! Strawberry shortcake is one of the best desserts ever. I love that you made it into pancakes. 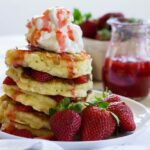 I am all for desserty breakfasts …err…breakfast for dessert or was that dessert for breakfast…GAH – these incredible, drool inducing photos have me drunk on strawberry shortcake goodness, I can hardly think straight!